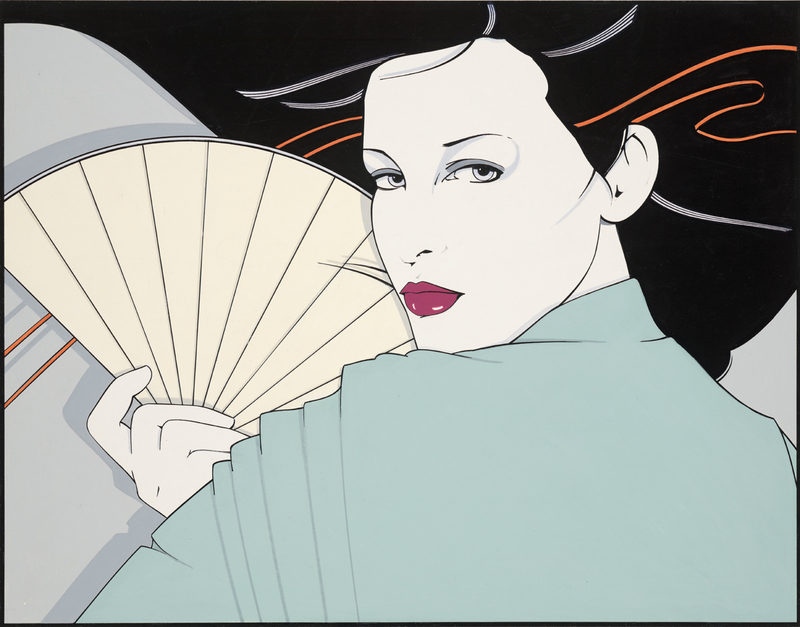 We are spotlighting a very special Patrick Nagel bracelet produced by Acme Studio from 1988. Known as "Grunwald", the imagery of this bracelet is rooted in Patrick Nagel's original piece for the promotion of An Exhibition of Serigraphs at The Grunwald Center for the Graphic Arts at UCLA in 1980. Below is an image of the original acrylic painting on board that was showcased at the Just Looking Gallery 2007 Retrospective Show. 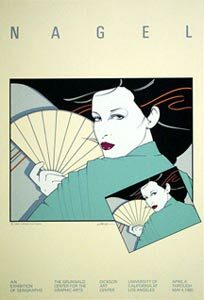 The original acrylic painting on board measured 12" x 15"
First published in March of 1980, this piece was released as a Silk Screened Serigraph Print by Mirage Editions, Inc. Measuring 25" x 17" and printed by Jeff Wasserman, the edition was limited to 250 signed and numbered prints and 1,000 signed in screen (printed signature) prints. The image was then reformatted and printed as a Progressive Set in April of 1980, as depicted below. Printed as a set of four, each measuring 5 5/8" x 7", this progressive set of images showed the process of the silk screen printing and the layering of colors. In 1988 the Patrick Nagel Estate paired with Acme Studio to create a series of collectible Patrick Nagel jewelry pieces. Continuing the progressive design aesthetic, Acme created a unique bracelet featuring the progressive development of Nagel's Grunwald piece. This bracelet from 1988 measures 7.25" long and is composed of 4 uniquely designed pendants, which are color progressions from left to right and each measure 1.375" x 1.125"
The craftsmanship and attention to detail in this bracelet make it an outstanding piece of art and jewelry. The back of each pendant is marked with the 1983 Dumas Inc Nagel Trade Mark and the Acme Studios stamp. This bracelet is accompanied by a Certificate Card from the Nagel Estate and Acme Studio, which identifies this piece as number 55 of 1,000 produced. This bracelet is currently being showcased and offered for sale for $295.